Music expresses the emotions, culture and ideas of the nation, and Armenian music is no exception. With rich history that spans folk, religious, pop, classical and everything in between, Armenian music expresses the temperament, happiness, sorrow, wanderings and dreams of its people. However, Armenian music isn’t only felt and understood by Armenians. Over the centuries, more and more nations and countries around the world have listened to, admired and adapted this music. It has proven to be universal language of communication of the myriad of emotions. Jazz often combines musical elements from various cultures, genres, and time periods, to create new, rich and diverse sounds. We are on our own journey of exploration of the world of cultures through music. This time, our journey brought us to the warm, rhythmic and inviting Cuba! 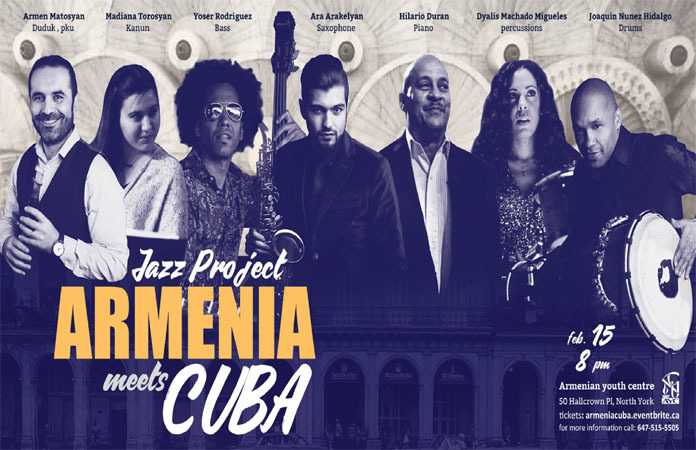 Let’s embark on this fascinating journey, where the ancient, mountainous, soulful music of Armenia interlaces with the dynamic and bold tunes of Cuba!